62445301681 ../;jsessionid=10178gs5g0bbdis4b139bar4x1e8sj.10178?wicket:interface=:0:beta-club:modal-container:modal-content:content:body:login-rixty-form:visibilityContainer:fbconnect::IActivePageBehaviorListener:1:1&wicket:ignoreIfNotActive=true It seems like your browser is preventing Facebook Authentication. This happens when your browser's Tracking Protection is enabled. To continue logging in via Facebook, please turn off Tracking Protection or use a different browser. 62445301681 ../;jsessionid=10178gs5g0bbdis4b139bar4x1e8sj.10178?wicket:interface=:0:login-panel-small:login-small:login:modal-container:modal-content:content:body:login-rixty-form:visibilityContainer:fbconnect::IActivePageBehaviorListener:1:1&wicket:ignoreIfNotActive=true It seems like your browser is preventing Facebook Authentication. This happens when your browser's Tracking Protection is enabled. To continue logging in via Facebook, please turn off Tracking Protection or use a different browser. 62445301681 ../;jsessionid=10178gs5g0bbdis4b139bar4x1e8sj.10178?wicket:interface=:0:login-panel-small:login-small:signup:modal-container:modal-content:content:signup-form:fbconnect::IActivePageBehaviorListener:1:1&wicket:ignoreIfNotActive=true It seems like your browser is preventing Facebook Authentication. This happens when your browser's Tracking Protection is enabled. To continue logging in via Facebook, please turn off Tracking Protection or use a different browser. 62445301681 ../;jsessionid=10178gs5g0bbdis4b139bar4x1e8sj.10178?wicket:interface=:0:redeemcode:modal-container:modal-content:content:body:login-rixty-form:visibilityContainer:fbconnect::IActivePageBehaviorListener:1:1&wicket:ignoreIfNotActive=true It seems like your browser is preventing Facebook Authentication. This happens when your browser's Tracking Protection is enabled. To continue logging in via Facebook, please turn off Tracking Protection or use a different browser. We are upgrading the Rixty Rewards Program to bring you a bigger and better loyalty rewards experience. As part of our continuous effort to improve our online services, we have retired the Rixty Rewards Program in order to introduce Razer Silver, an exciting loyalty program for gamers, backed by Razer. This brand new rewards experience will be brought to you soon. To make this happen, we discontinued Rixty Rewards effective 12am on February 15, 2019 (Pacific Time), and all unredeemed Rixty Reward Points have been forfeited. Look forward soon to a greater experience with Razer Silver, with a vast selection of rewards to redeem, many new ways to earn, and more. For more information on what you can expect, please visit https://gold.razer.com/silver/about. Estamos atualizando o programa de recompensas Rixty para oferecer a você uma experiência maior e melhor de recompensas por fidelidade. Como parte do nosso esforço contínuo para melhorar os nossos serviços online, retiramos o programa de recompensas Rixty para apresentar o Razer Silver, um programa de fidelidade emocionante para jogadores, oferecido pela Razer. Uma nova experiência de recompensas será trazida para você em breve. Para que isso aconteça, encerramos os Pontos Rixty a partir das 12h do dia 15 de fevereiro de 2019 (horário do Pacífico), e todos os Pontos Rixty não resgatados foram perdidos. Aguarde em breve uma experiência ainda melhor com o Razer Silver, com uma vasta seleção de recompensas para resgatar, muitas novas maneiras de ganhar e muito mais. 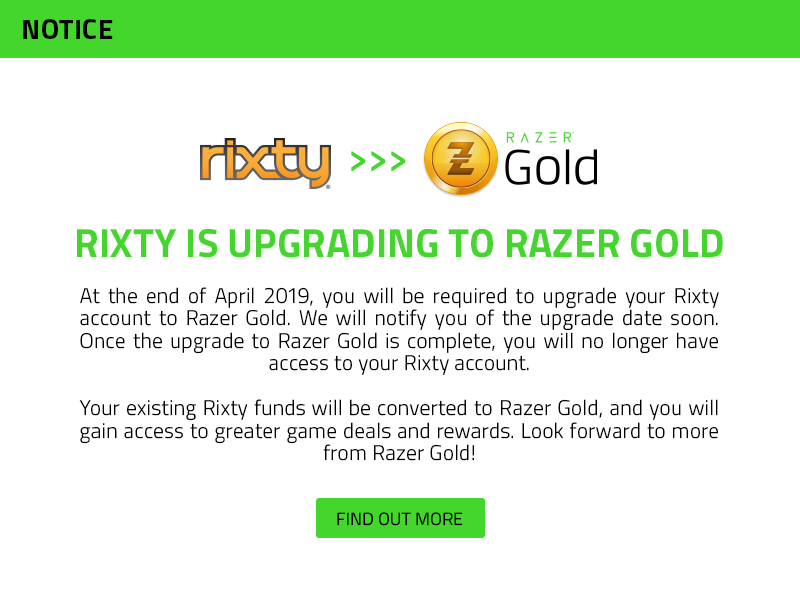 Para mais informações sobre o que você pode esperar, visite https://gold.razer.com/silver/about. Estamos actualizando el Programa de Recompensas Rixty para brindarle una experiencia de recompensas de lealtad más grande y mejor. Como parte de nuestro esfuerzo continuo por mejorar nuestros servicios en línea, estamos retirando nuestro programa de recompensas atual para presentar Razer Silver, un programa de lealtad emocionante para gamers, por gamers. Pronto te traeremos nuevas características de ganancias y recompensas. Y para que esto suceda, descontinuaremos Rixty Rewards el 15 de febrero de 2019. Pronto una mayor experiencia una experiencia de recompensas Razer Silver, con una amplia selección de recompensas en el catálogo. Para obtener más información sobre lo que puede esperar, visite https://gold.razer.com/silver/about.